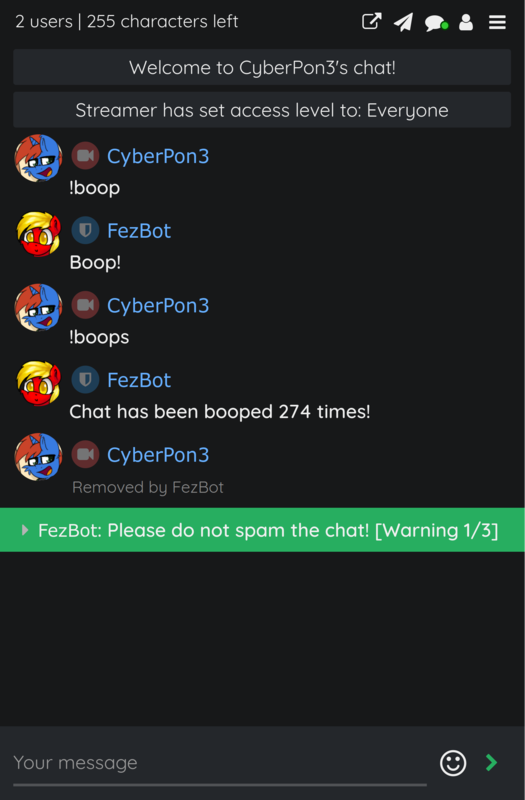 !Boop, !hug, and !ship your way to victory with fun commands to keep your chat engaged. Automatically deal with spammers, filter out offensive messages, and keep your chat safe with a completely customizable auto-moderation system, including nsfw filtering for common websites and more. Pick a winner with custom raffle lists and opt-in drawings. Keep track of what's been said, or just look up that link you remember from last week. Make your own !help command, setup a list of !links, and share your other !profiles - you can make unlimited custom shortcuts for your chat. Get detailed stream and chat statistics. Track your views over time, see when chat's the most active, and find out just how many times Seafood's said "wew!". Take and save screenshots of your stream (or other's) to share with the world. Welcome newcomers to your stream! Tell them what you're up to, share your artist profile, or just say hello. Make a quick announcement or set up a list of messages to auto-post every once in a while. Integrate with popular sites to let you do things like searching Derpibooru or querying WolframAlpha. Tie into your Discord server to get steaming notifications and managed Discord ranks for your subscribers and followers. Show off you chat and recognize new subscribers and followers with an integrated stream overlay. Queue up requests for songs from popular sites like youtube (with your approval of course). Have a cool idea? Let me know!